Well, I finally made it to Purl Soho! Charming. Everything about it. The yarn and fabric were so delicious. The girls working were helpful and kind. The place was buzzing with happy customers. Great, great energy! It really was a thrill for me. I even traveled with my Knit New York book! 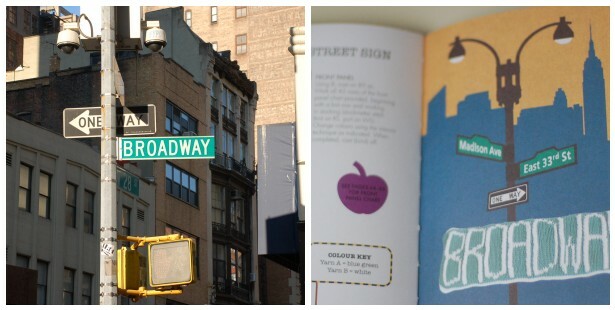 The fun little book is filled with 10 iconic NewYork projects. There is a Broadway street sign to knit a cute pillow. 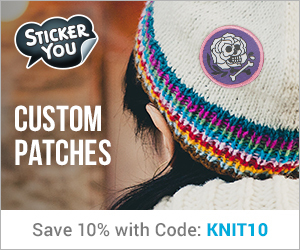 Ten great knits to remember your trip, dream about a trip to NYC or just knit something different... because you can! Well, Sterling publishing would like to give away a copy of Knit NewYork by Emma King to two of my readers. If interested, please leave a comment here before Monday, March (!) 4th, at 5pm and I will have the random generator choose a number. Oh how fun! Someday I will go there. And it will be fab-u-lous. So glad you made it to Purl Soho! Such an inspiring place, and fun to see the yarn and fabric in one place! The book looks adorable! The one and only time I was in NY I wasn't a knitter yet! Ack! I would SO love to go to Purl Soho! I just got back from New York, as my daughter now lives in Brooklyn. We visited Purl, which I love, although the old location was somehow more charming. I've never heard of that book but it sounds adorable, so please enter me! Thanks! I'm taking my kids to NYC for Easter break, my daughter and I are both knitters, the book would be a perfect fit for us! super cool! I love that place ... everything inside is gorgeous! this book looks pretty great, too. thanks! Wonderful post... I would love a copy! What a fun trip and the book looks like lots of fun. 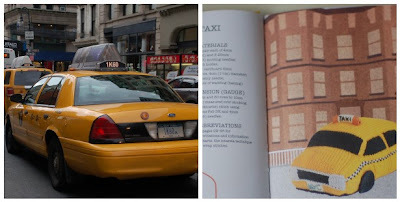 I'm very jealous - I'd love to go to NY and to purl soho... that book looks like lots of fun. Ohhh you lucky girl-I wanted to visit so badly when in N.Y.- however we walked past at 10a.m.-to find it opens-11a.m. Thanksgiving weekend and had too many other obligations! Ugh-too much to do with the fam. So missed it. 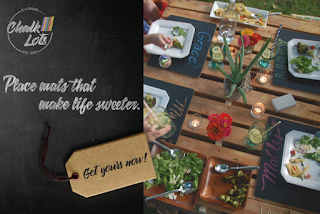 Luv your blog-and the snicker-doodle brownies.... Yum. The book looks so cute- luv a copy. I pushed "anonymous" by mistake-(new to this). So here is a name....for my comment above. Oops. I live on the other side of the Hudson and still have not gone! I love Purl Soho, it's one of my favorite yarn shops. And I'm lucky enough that it's within walking distance from my house! NYC! What a perfect giveaway. Thanks! How I'd love a copy of this book!!! I so love NY and miss it terribly!!! This book looks great! I'm going to New York for the weekend and hope to visit Purl Soho sometime soon! Great giveaway -- it's such a fun book!!! That looks like such a fun book! Thanks so much! Love this book! And I love knitting things and toys. Great giveaway. This book sounds awesome! My in laws are in NYC, so we go there often. I am so happy for you that you got to visit one of my favourite destinations dreams! Lovely book to remember your trip by. Lucky you! I visited Purl 5 years ago and thought the girls there were so nice. So cute! would love to get this book. Thanks for the chance. I'm jealous. I would have loved to visit Purl Soho and all the sights in the book. The book is so cute! I love NYC! I was just mentioning to our mutual friend Kam that we should go to NYC for a weekend to look at flower stores and knitting stores! Such a cute book. Thanks for the giveaway. I was in New York recently, and I am still sad that I didn't make it to Purl. This book looks like so much fun. I love Purl! And this book looks adorable. Thanks! Ah, to go toPurl-Soho, an knitters Dream! For that matter, I'd love to go to New York period! What a fun book! It would be perfect for my upcoming trip to NYC next month! 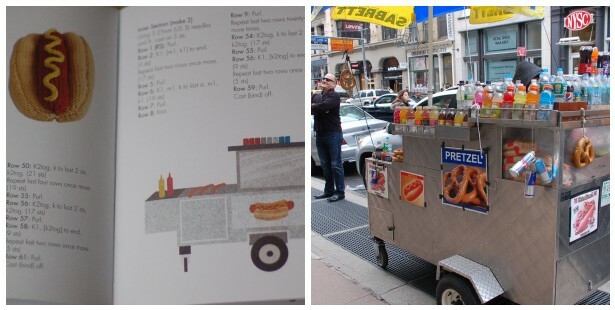 The knit hot dog is hilarious! Oh how jealous I am! One day I might get there! What a great book, I love visitng Purl Soho when I am in town. Oh,I love New York! I was there in August and had such a glorious time! I LOVE NYC! Going to P is a destination! I cannot wait to knit my way thru the Big Apple -- count me in. SO JEALOUS! I love PURL SOHO! I can't wait to go....EVENTUALLY! What a fun book! And what a lovely city to carry it around in! I went to Purl Soho in October and loved it! One of my dear friends resides in NYC and is expecting - seeing as how she is crafting challenged, I would love to knit her a taxi... It would be perfect!! That is a truly AWESOME book! oh please hope I win! that shop must be yarn inspiration nirvana!! 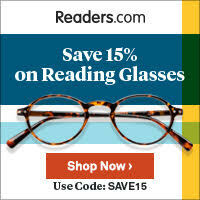 I have bought from them on-line many times and it is on the top of my list of places to go when I make it to New York!! Oh, I would love that book! I have to go visit this knitting store on my next trip to NYC. I love to win the book - thanks for the opportunity! Love NYC and love that store! It would be a unique memento of our family trip to New York! Okay cute book! New York is the best. I can't wait to go back one day! Oooh! I have seen that book and loved it!! Would so love to win! I LOVE NY, and I'd love to win this book! How fun! Such a cute book! I will make it to NYC one day! Looks like a fun trip --I'd love to win the book! I'm only an occasional visitor to NYC to see my step-daughter, but the book really seems to capture the essence of the city. What an absolute treat to go to Purl! Someday I will!! Thanks, Leslie! I discovered Purl Soho online. I live in Oklahoma. I enjoy the blogs and the ordering from them has always been a pleasant experience. I love reading about knitting. This book looks interesting. And I slow down to read this post on March 4 at 8:00PM. Oh well...better luck next time. Loved getting to see your trip. That book look super cool!